And new research finds that they could help with reading and writing. With its Learning Tools, Microsoft has developed a few ways to make it easier for students to get a better handle on reading and writing. One tool, for example, can read your words aloud and help you identify common grammatical issues. Another, called Immersive Reading, can also read text aloud while highlighting it in "focused" view (where words are spaced out in a distraction-free environment). The Learning Tools started out as a OneNote plug-in, but Microsoft has steadily expanded it to Office apps on desktops, mobile and the web. 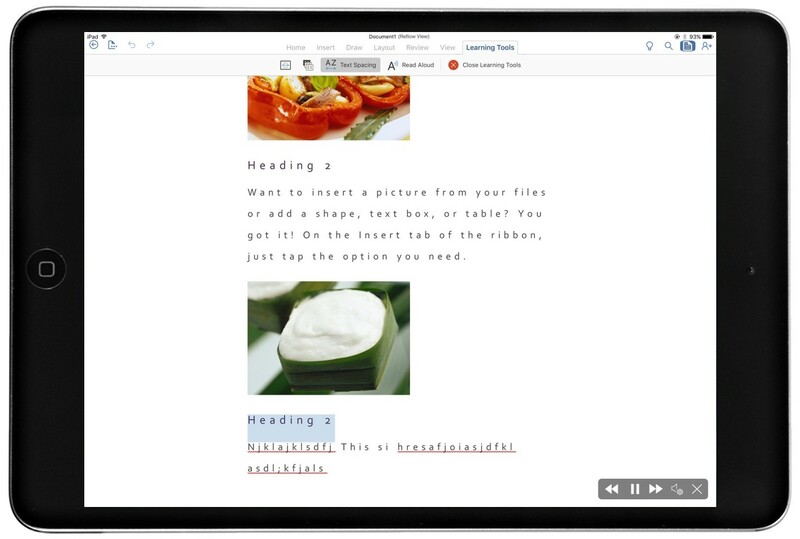 Today, the company announced they're headed to Word for iPad. To begin with, the iPad Word app will get some basic capabilities from the Immersive Reading tool. It'll recite text out loud while highlighting individual words, and you can also change the word, character and line spacing to make it easier to comprehend. They're the sort of features that could help anyone focus. But, in particular, they could be essential for students with ADHD, dyslexia, dysgraphia or those just learning how to read. The feature will also work for every language supported by Word for iPad. Additionally, Microsoft unveiled a new study today, produced by RTI International's Center for Evaluation & Study of Educational Equity, that shows its Learning Tools get results in real classrooms. One key takeaway: Students using Learning Tools gained 10 percentile points on average in reading comprehension, while those who weren't using them dropped by 0.62 points. "Teachers observed that having text read aloud to their students, regardless of grade level or reading ability, helped readers to focus on the ideas in the text," wrote the study's author, Katherine McKnight, PhD. "For struggling readers, features such as highlighted words and word spacing, the pacing of the voice, the gender of the voice, background color, font size, and parts of speech helped to improve reading mechanics." Dr. McKnight also notes that the high comprehension gains could be partially due to the lower reading levels in the testing group. Typically, there's more room for growth when you're starting low. And since the study didn't control for differences in how students learned to read in the test cohort, compared to historical data, she can't claim that Learning Tools led to the improved comprehension specifically. Learning Tools is also available for free across OneNote's apps, Word on the web and desktop, Outlook on the web, and in the Office Lens app on iOS. Microsoft's Edge browser also recently gained the ability to read any webpage aloud with the Windows 10 Fall Creator's Update.